Experience with FaaS predicts whether or not someone prefers functions. In fact, 63 percent of those with broad production FaaS implementations would standardize on functions. Among those with initial production use of FaaS, the voting between containers and functions was essentially tied. The experiences of these early adopters may impact future architecture decisions. If there are too many hiccups with functions, then containers or even VMs will remain the preferred level of abstraction for developers. The New Stack’s history of covering the containers had an impact on the results. 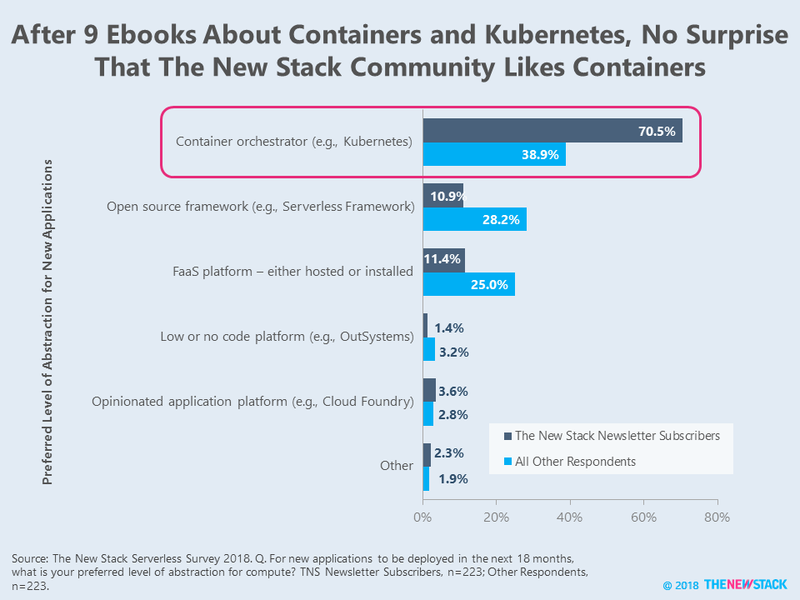 Almost half of the respondents originally subscribed to our newsletter because they read one of our nine ebooks about Docker and the Container Ecosystem and the Kubernetes Ecosystem. This group was almost twice as likely to prefer container orchestration when deploying new applications. Those deep into the serverless world lean towards functions while a broader group of cloud-native cohort tends towards containers. 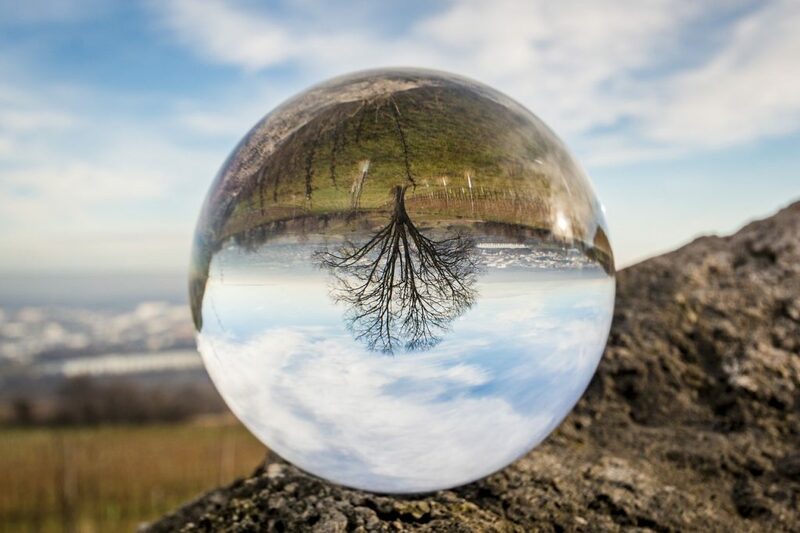 It remains to be seen whether or not functions will leapfrog containers among those that have yet to adopt cloud-native architecture. Broad use of FaaS does not point to any barrier to abstracting the entire IT infrastructure to functions. Yet the most casual users of FaaS actually prefer both containers and VMs to functions. 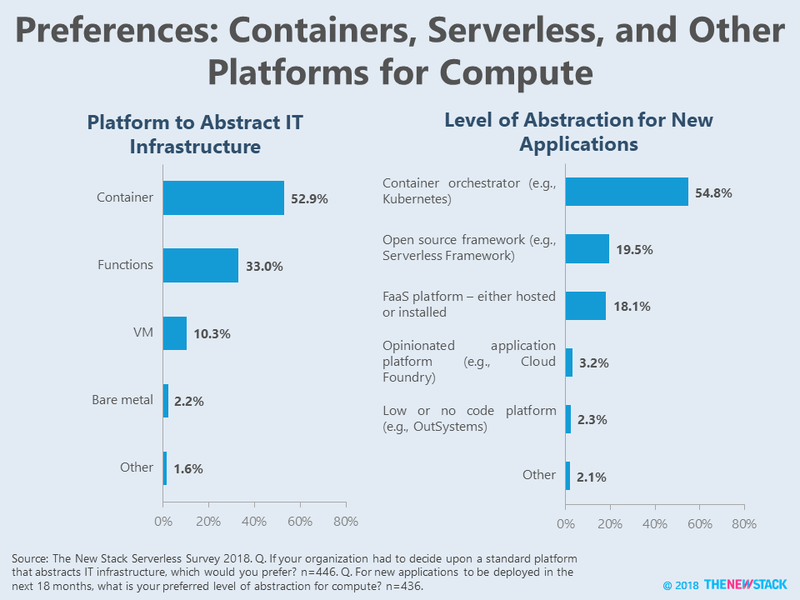 People that have already studied containers and Kubernetes are less likely to look to FaaS or an open source framework to deploy new applications.